In order to reserve your place on a tour, a deposit of 50% of the total value is payable (this may change from time to time depending on the nature of the tour). In booking the tour you guarantee full payment to us of the total adventure value. We will either email or write to you to confirm your booking. The remaining balance outstanding must be paid no later than 8 weeks before the start of the tour (if this date has already elapsed then full payment is due upon reserving a place on the tour). In some circumstances it is possible to pay by standing order, details of which will be given in each tour itinerary. If full settlement is not received by the due date we reserve the right to cancel the booking in line with the charges as detailed in “If you cancel”. Paying a deposit is deemed to be an acceptance of both the booking conditions and the terms and conditions of booking on a tour. Each tour bookings is subject to a £75 administration fee. This, along with your total deposits received to date, will remain in the Bank Trust Account until such time that a tour is confirmed to proceed i.e. minimum numbers have been reached. In the event you cancel your booking, this will be included in the cancellation charges as detailed in "Cancellations Made By You" (i.e. it won't be added to them). If we cancel the tour, for example, if we do not reach the minimum booking level, then the administration fee will not be charged or removed from the Bank Trust Account and you will receive back 100% of your deposits paid to date. You may pay both the deposit and balance by cheque or electronic transfer (BACS or CHAPS). Please allow enough time for the funds to clear by the payment due date. Unless stated otherwise on the tour itinerary, fees include hotel accommodation, breakfast, evening meal, travel information pack and any ferry crossings. Lunches are generally excluded so as not to dictate where and when to stop. Hotel – drinks, papers, room service and any items you order while at the accommodation are your responsibility. You must pay off in full any outstanding accounts before checking out. Ferry crossings: - if you miss any prearranged ferry crossings or other third party carriage included in the tour package it is your responsibility to pay for any additional costs incurred. Other: – other examples of add on costs which are your responsibility are those relating to, breakdown, other accommodation and meals outside those included in the tour package, fuel, tolls and personal acquisitions. In order to participate you must be age 21 or over at the time the tour takes place. These tours are for people who have a passion for driving and exploring new places therefore there are no categories. You can drive anything from a Lamborghini to a Lada – everyone is welcome. If you request, we will endeavour to make any minor amendments to your booking. Any amendments must be notified to us as soon as possible. If we are able to implement the changes an administration fee of £30 per person will be levied in addition to any further direct add on costs. Although very unlikely, from time to time we may need to make amendments to your booking. Owing to the nature of bookings made with third parties months in advance, changes are sometimes unavoidable. Any changes we need to make will be notified you as soon possible. Changes can vary from something relatively minor such as changes to a ferry departure time or simply a change to the planned route to something major like a change of accommodation. If you cancel your booking on a tour you must notify us in writing as soon as possible. You will be liable to cancellation charges as detailed below. We reserve the right to cancel your holiday under any circumstances. If an alternative equivalent holiday is available we will first offer you the option to go on this (or allow you to use your entry fee pound for pound for another tour). Otherwise you are entitled to a full refund of all money received from you up to the time of the cancellation. If the cancellation of your booking is due to the reasons below (see “termination by us” and “force majeure”), we reserve the right to cancel your booking without refund of any monies received from you. Termination made by us In the interest of all concerned, we reserve the right to prohibit your participation in the tour if we become aware of any illegal, inappropriate or antisocial behaviour. If this condition is enforced you will in no circumstances be entitled to any refund of the booking fees and we will not be held responsible for any additional costs you incur as a result of your termination. Tours run in conjunction with a named third support (i.e. car dealers and car clubs), are wholly controlled and run as Driving Adventures Tours and all appropriate terms and conditions apply between Driving Adventures and clients booking on the tour. The third party promotion merely constitutes a voluntary support of the tour and does not form any part of the contract between Driving Adventures and its customers. If the third party removes their mechanical support for whatever reason (e.g. personal injury, business closure or even through choice), this will in no way, unless specifically notified by Driving Adventures, infringe in any way, the ability of the tour to proceed. i.e. the "show will go on". Driving Adventures will of course, given the time scale available, endeavour to replace the support that the third party has withdrawn and appoint an appropriate substitute. Please note it may not be possible to replace third party support should insufficient time be available to us from the time that we are made aware of any third party support cancellation to the time of the commencement of the tour. Should Driving Adventures cancel a tour due to the removal of a third party's mechanical support, all clients monies will be refunded in full. If you, the booking client, decide to withdraw from a tour owing to the withdrawal of third party support, you will be governed by the charges set out in "Cancellations Made By You". Except where expressly stated within these terms and conditions, we regret we cannot accept liability or pay any compensation where the performance or prompt performance of our contractual obligations is effected or prevented by, or you otherwise suffer any damage or loss as a result of, “force majeure”. This means any event which we or our suppliers could not, even with all due care, foresee or avoid. Such events may include war or threat of war, riot, civil strife, terrorist activity or actual threatened terrorist activity, industrial dispute, natural or nuclear disaster, adverse whether conditions, fire and all similar events outside our control. It is your responsibility to ensure you abide by all statutory laws and regulations of each of the countries the tours travel through. These include, without limitation to, your regard to speed limits, the legality of your vehicle (e.g. tax, insurance, MOT) and not driving under the influence of any intoxicating substances. You must hold a full valid driving license and passport if applicable. You are in no way allowed to compete or race with other guests. You are entirely responsible for your own behaviour and in no way can Driving Adventures Limited be held responsible by you or any third party if you undertake in any illegal or antisocial behaviour. You will therefore indemnify Driving Adventures Limited in full, against any attempt by third parties to bring about any claim as a result of any breach by you of any laws or regulations during your participation on the tour. Unfortunately, it is the nature of making bookings in advance that prearranged events may be delayed for reasons out of our control. In the event of any travel delays both before and during the tour, whether foreseen or not, can in no way be deemed to be our responsibility and therefore we will not be liable for any extra costs you may incur. Examples of such costs are, but not limited to, hotels, ferry crossings, hire cars, meals and drinks. These conditions apply regardless of the how the delays were brought about. Examples are, but not limited to, adverse weather conditions, natural disasters, technical difficulties industrial disputes. For whatever reason you are unable to complete the tour you will in no circumstances be entitled to any refund for any unused services booked on your behalf. Any carriage by third party operators either by air, sea or rail will be subject to the terms and conditions of the carriage supplier. It is your responsibility to ensure you have the appropriate travel insurance in place for yourself, passengers in your vehicle, luggage and the vehicle itself. As described on the “Consumer Protection” page, all monies received from customers are paid into a Bank Trust account administered by an independent third party. Only upon completion of the tour are those monies paid to Driving Adventures Limited. This is to ensure that if Driving Adventures Limited were to go into liquidation before a tour took place the customer is guaranteed a full refund of all monies received. Third party variations: – we will endeavour to fix prices with our suppliers wherever this is possible. If in the event we cannot there may be an additional cost to bear if suppliers increase their prices. Currency variations: – The price of the tours are calculated at the rate of exchange against the £ at the time the tour is posted onto the website. Government action – Items such as levies or landing fees may alter without prior notice. In all of the above cases Driving Adventures Limited will absorb any adverse cumulative cost increases up to 5% of the original entry fee. Thereafter it will be your responsibility to pay any additional cost. You are not required to place any livery on the exterior of your car and you are not permitted to place any number stickers on the exterior of your car. This can in many cases invalidate your insurance and can attract the wrong kind on attention while generally destroying the look of your car. If you do choose to place stickers on your vehicle we reserve the right to insist on their removal if we feel they are in any way inappropriate. In participating on a tour you agree to have photographs and cinematic footage taken of you and your property and agree to allow Driving Adventures Limited the use of these images for its website or other promotion purposes such as magazines, films and documentaries without any charge. You are entitled to take your own pictures and filming but in no way can you market these as officers of Driving Adventures Limited. If you do not agree to these conditions please inform us in advance of your participation in the event as you cannot make any retrospective claim for invasion of privacy or defamation. If you feel there is justification for complaint either before or during the tour you must notify one of our representatives immediately in order that we can attend to your complaint as effectively as possible. If upon returning home you are not satisfied with how your grievance has been attended to please inform us in writing within three weeks of the last day of the event. We will endeavour to make sure that for all parts of your tour that we have agreed to arrange, perform or provide as part of our contract with you are done so with reasonable skill and care. In relation to the supply of goods and services, we will not be liable to you or a member of your party, accept where expressly stated within these terms and conditions, for any injuries, liabilities, damages or other losses incurred by you or your property. Unless stated otherwise in these terms and conditions, our total liability to anyone lodging a claim in relation to our negligent act shall not exceed the cost of the tour incurred by that person. Those parts of your tour which involve utilising the services of third parties (e.g. flights, hotels, ferry crossings) will be governed by the terms and conditions of each individual third party. You and the members of your party are responsible for all add on costs as described elsewhere within these terms and conditions, in addition to items such as fines, penalties, damages and other expenses incurred by you during the tour. If we are in anyway held accountable for such items, you will indemnify us and promptly repay any amounts we pay on your behalf. In participating on a tour, you do so voluntarily and in the full knowledge that any accident, injury or other incident to you or third parties as a result of your actions is entirely your responsibility and liability and you therefore indemnify Driving Adventures Limited and its directors and officers in full against any claim brought about by you, a member of your party or a third party. From time to time it may be necessary to amend the terms and conditions to reflect the nature or timing of a particular tour. In these instances details will be made clear on the itinerary page of the applicable tour under “Special Conditions”. Driving Adventures Limited endeavours to ensure that all third party suppliers utilised in bringing our customers track day experiences carry out their duties with the utmost degree of professionalism that our customers expect. In booking an experience through Driving Adventures Limited you are bound by, and therefore liable if found in breach of, all of that third parties terms and conditions. Driving Adventures Limited cannot be held responsible if a third party exercises its right to cancel or postpone an event owing to conditions outside of the control of Driving Adventures Limited (e.g. adverse weather, unexpected emergency track maintenance). 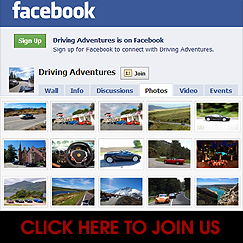 Driving Adventures Limited is a company registered in Great Britain. It is governed by the English law and therefore the contract between you and Driving Adventures Limited falls under the jurisdiction of the English courts.